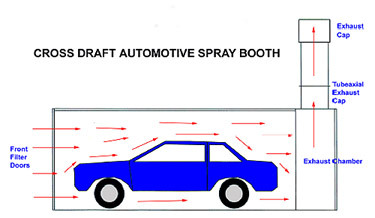 It is important to point car in the direction of airflow on all cross draft and semi down draft booths (as shown below in the first two examples). 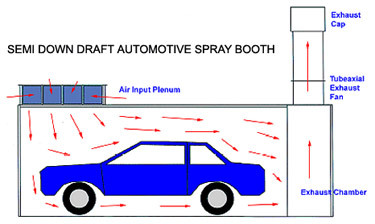 The reason for this is to allow air to flow smoothly over the front of the car and not slam into the back of the car. Just as if you were driving down the road! These filters are the final layer of defense against surface damaging particles entering the booth. Intake filters are as important as the booth itself. Typically, these filters are designed to capture particles 10 microns and larger in efficiencies up to 100% with a standard air flow spped up to 150 fpm. If higher levels or efficiency are desired, prefilters can be installed to capture up to 99.97% of particles 0.3 microns and larger. Most intake filters are also designed to diffuse the air providing an even air distribution throughout the booth. Pre-filters are an excellent way to decrease the amount of particles <10 micron from entering the booth, and extending the life of the intake filter. Many options are available for airflow speeds up to 500 fpm, and efficiencies up to 99.97% on .3 micron particles and larger. The primary consideration in choosing a pre-filter is the resistance to air-flow each style provides. Many booths have limited area in the housing for pre-filters, reducing the available options. 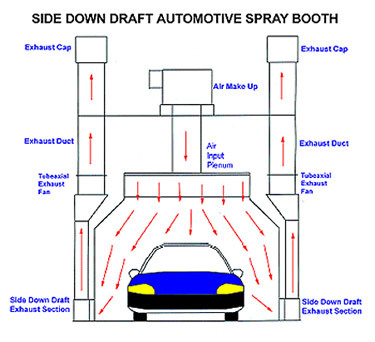 Exhaust filters are designed to capture overspray before exhausting or recycling air from the booth. The filter options vary in their efficiencies and holding capacity for each type of coating. 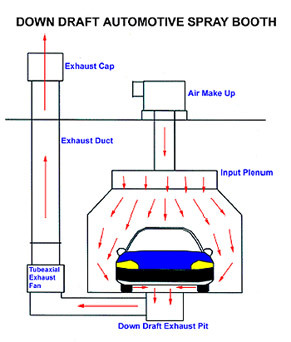 By determining the appropriate combination desired, a one to three stage exhaust system can be developed. Typically a flat pad or blanket is used as first stage and occasionally is the only stage of defense. The extended surface filters are designed as a second or third stage.